HMH Books for Young Readers, 9780547279770, 304pp. With frostbitten fingers, sleepless nights and sore muscles, 14-year-old Jackson Jones and his posse of cousins discover the lost art of winging it when they take over an orchard of 300 wild apple trees. They know nothing about pruning or irrigation or pest control, but figure it out they must—if they are to avoid losing $8,000 (because of an unfair contract). 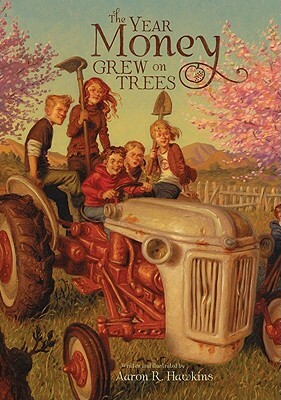 With spot illustrations for mechanical-loving readers—the gears of a tractor, a plow with disks—and with mathematical calculations of the great mount of money to be earned, this novel has the sort of can-do spirt and sense of earned independence not often found in today's fiction. Aaron Hawkins tended his grandmother's orchard as a child. About his first novel, The Year Money Grew on Trees, he writes: "I hoped to create a story that contained some of the things I learned: appreciation for nature and growing something, the self esteem that comes from hard work, and the love for family and friends that comes from struggling together." He still owns the orchard to this day.